I could physically only get this shot during the Formula Drift weekend, because I am actually standing on the race course. 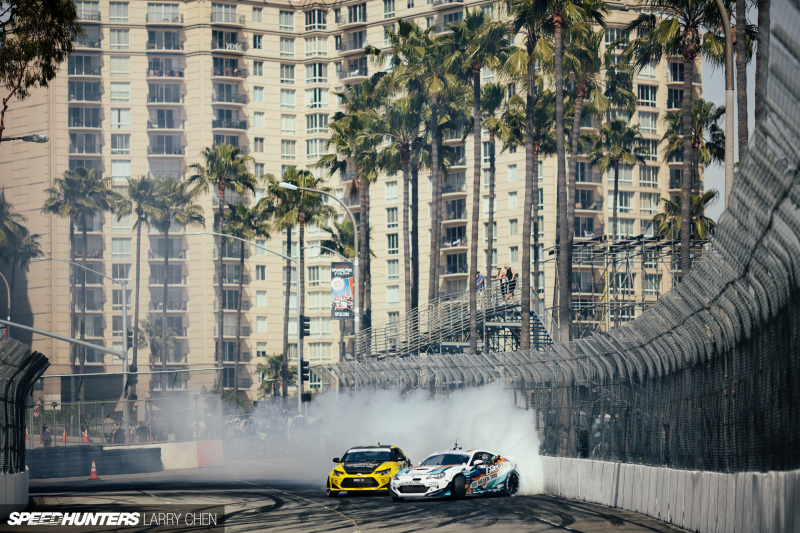 Of course, it doesn’t matter as the end of the FD course is at the exit of Turn 11. The weekend afterwards they run the entire length of the course for the Grand Prix. Shooting racing in the rain is funny in that it’s terrible looking if it’s just a little bit of a sprinkle, so I always hope for pouring rain or nothing at all. 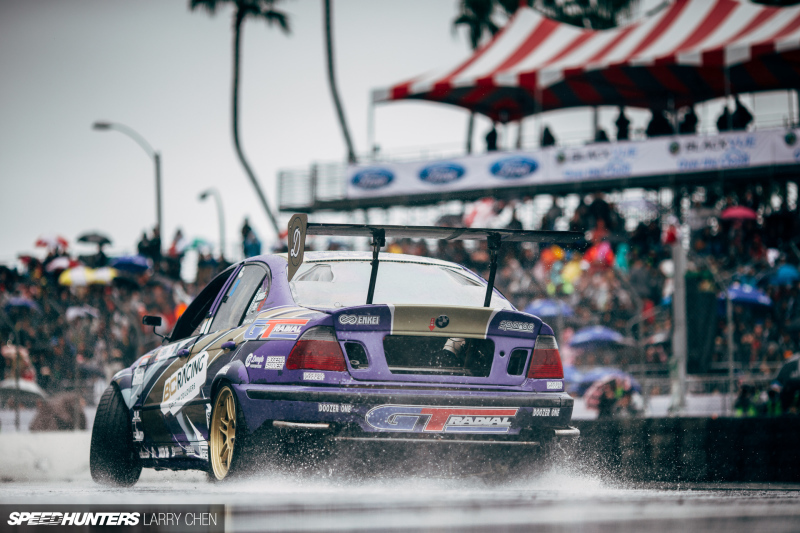 Long Beach is the most unforgiving Formula D track, and it’s great because it’s the season opener, which is like the body damage equivalent to ripping off a bandage quickly and getting it over with at once. While it’s neat that for the first time in 11 years there was so much rain during an FD weekend, it sucked for me as I could not have as many remote cameras up. That’s partially because the photos would not come out due to the amount of rain and mist on the lenses, but mostly due to the fact that there was not enough light to freeze the action. Luckily it dried up during Top 16, but it was still not enough to warrant a full arsenal of remote cameras. 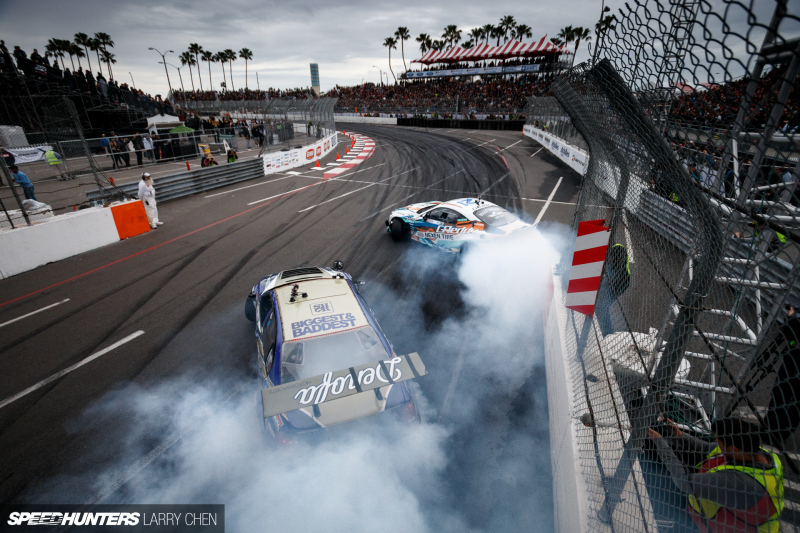 Forrest Wang makes the most smoke out of the entire grid of drivers, and also initiates earlier than anyone else. I always make a point to capture his antics on course.